Priscilla Roberts, PhD, is associate professor of business at the City University of Macau. With Spencer C. Tucker and others, she has coedited and contributed documents to 11 ABC-CLIO encyclopedias. Priscilla Roberts. 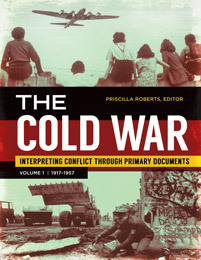 The Cold War: Interpreting Conflict through Primary Documents [2 volumes]. ABC-CLIO, 2018. ABC-CLIO, publisher.abc-clio.com/9781440852121. This detailed two-volume set tells the story of the Cold War, the dominant international event of the second half of the 20th century, through a diverse selection of primary source documents.